Frida Escobedo explains how one of her first residential projects, Casa Negra, was influenced by the function of a camera obscura, in the third instalment of a series of short movies about the Mexican architect. In an exclusive interview, Escobedo tells Dezeen that the house she designed for a photographer acts like a camera obscura – a photographic device that can be used to project the surrounding environment directly onto a screen. “When we were first thinking about the ideas behind this project, the camera obscura was one of the references,” Escobedo told Dezeen. The house takes the shape of a black box raised off the ground on columns and is fronted by a glazed box, offering views of Mexico City. 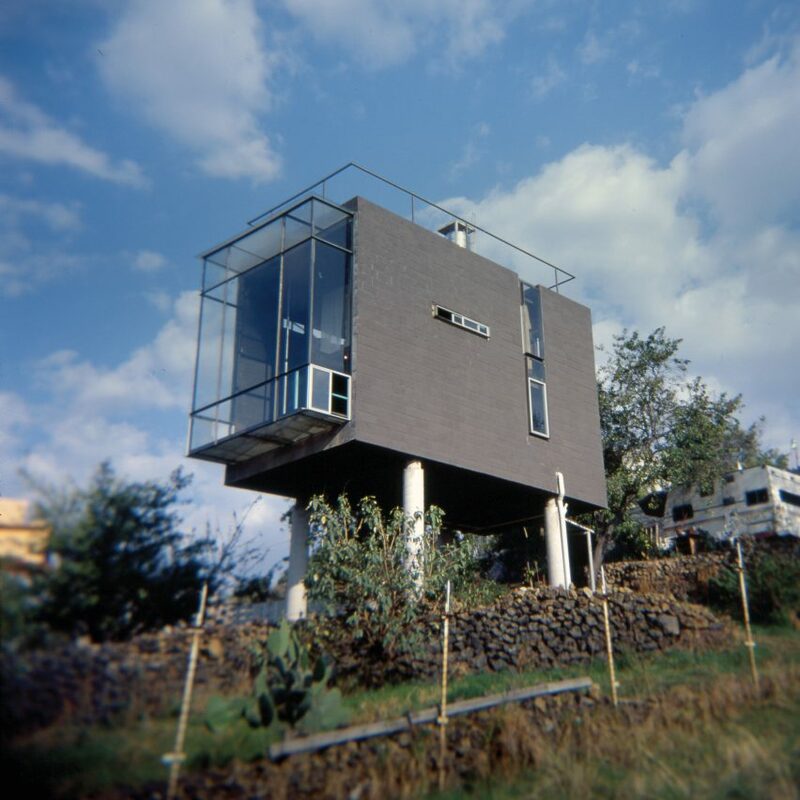 Escobedo designed the house together with architect Alejandro Alarcón, her partner at the time. 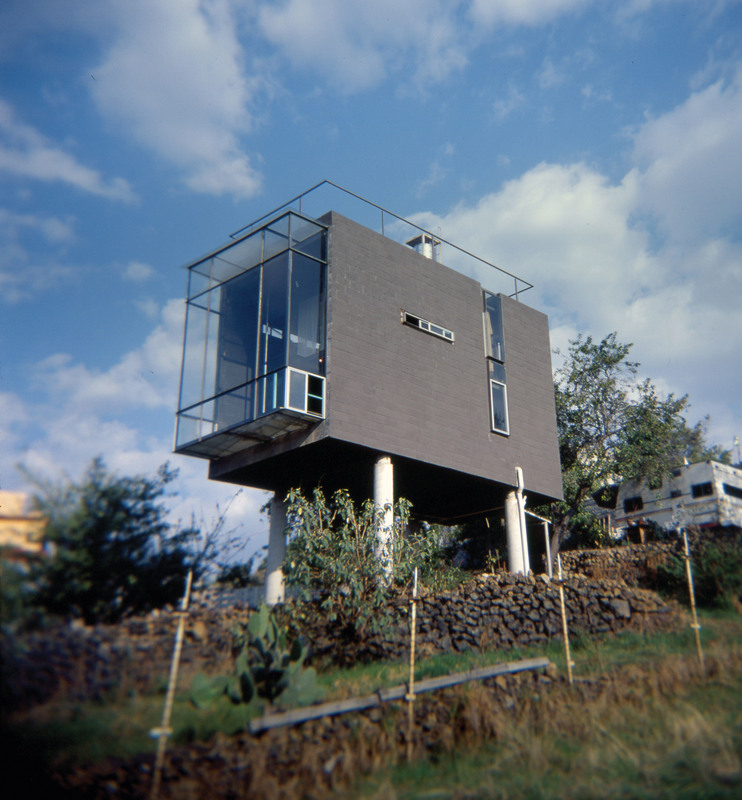 The house was built with a limited budget and materials. “Our friend is a photographer and he had very little money. We had to work with very little resources, so it was about creating the most space with the least materials,” Escobedo said. 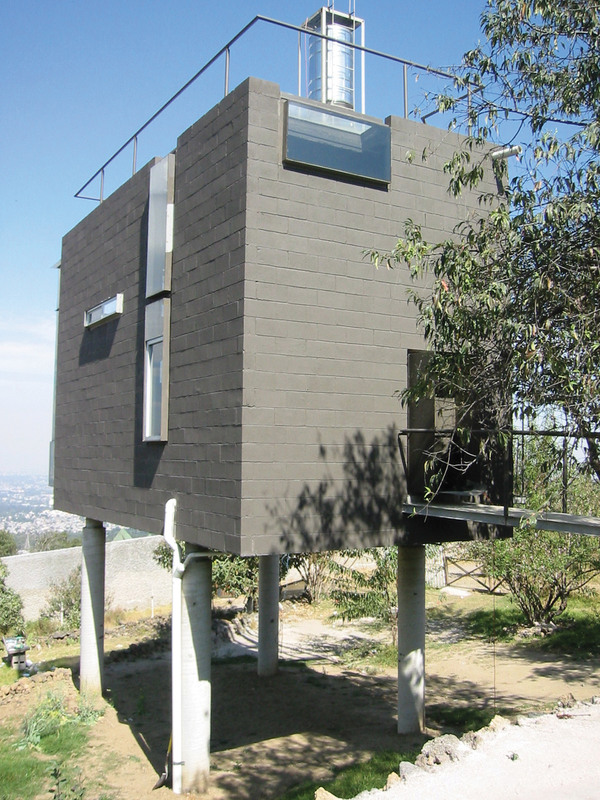 The small house accommodates living, sleeping and kitchen areas, as well as a roof terrace offering views of Mexico City’s landscape and a small patch of public space underneath the raised structure. “It’s basically just one suspended box that creates a public space underneath,” she said. 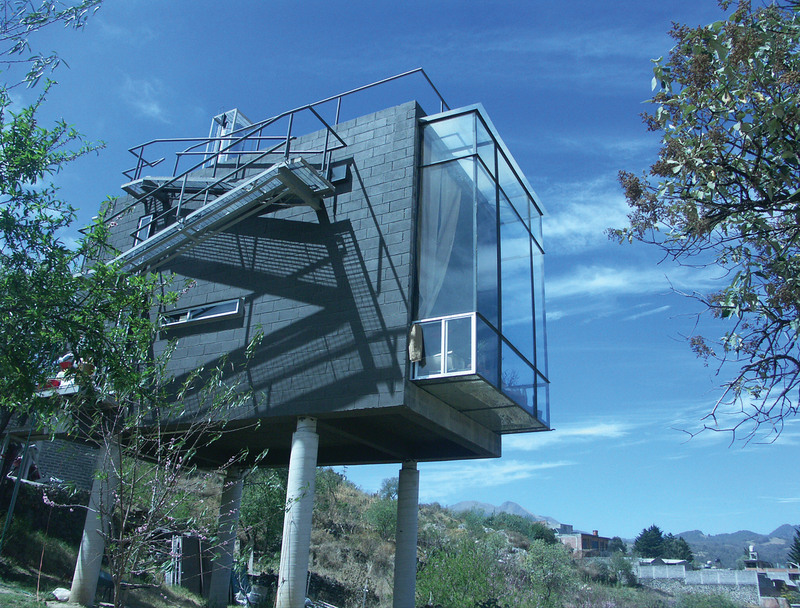 One of the challenges of building in the hills of Mexico was that the structure needed to maintain heat during the night time. “We painted it in a very dark grey so the sun would heat the house up in the morning and in the evening it would radiate heat. It was a very practical solution but it made the house resemble a camera itself,” Escobedo explained. “It was a very simple and cheap project,” she concluded. 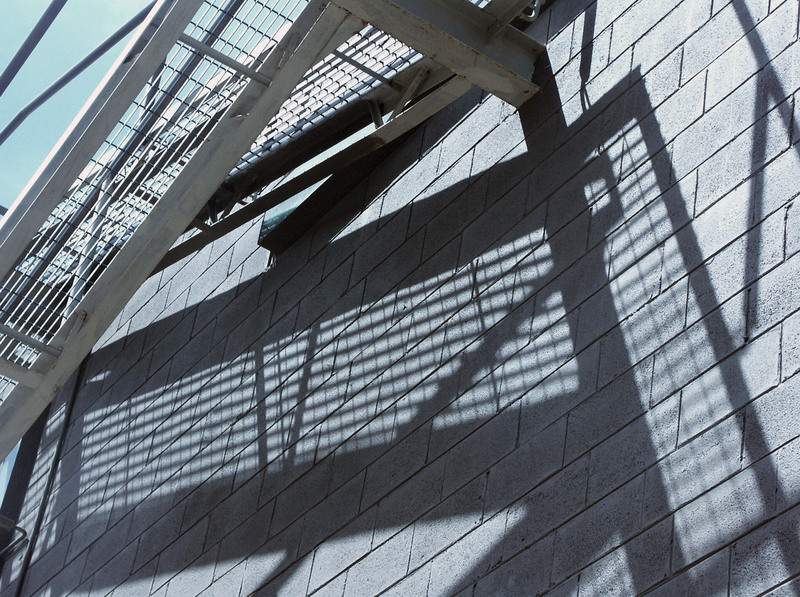 Simple materials and forms such as the ones used for Casa Negra are a frequent feature of Escobedo’s work, such as the mass-produced cement roof tiles used at her 2018 Serpentine Gallery Pavilion, or the perforated concrete blocks that screen her La Tallera gallery complex at Cuernavaca in Mexico. “It’s not necessary to have a very luxurious material in order to achieve a very sophisticated feeling or mood,” Escobedo told Dezeen in the first movie in this series of interviews. Born and raised in Mexico City, Escobedo set up her studio, Frida Escobedo, Taller de Arquitectura, in 2006. In 2018, she became the youngest architect ever to design the Serpentine Gallery Pavilion in London, which took the form of a rectangular courtyard framed by latticed walls made from black cement roof tiles. Escobedo is a judge for Dezeen Awards 2019. The post Casa Negra is designed to “be like a camera obscura” says Frida Escobedo appeared first on Dezeen.